Hangnails, dry cuticles, and cracked nails. I hate them, you hate them. But what's a girl to do? You've tried lotions, creams, ointments and salves. I have too! But as soon as you wash your hands, it's all gone! And you have to start over. Who has time for that? The answer? Nail and cuticle oil. There are many great oils created by amazing companies. And many work quite well—but only as cuticle oils. So why did I create Simply Pure™ Nail and Cuticle Oil? Because I'm allergic to almonds. And every cuticle oil on the market uses Almond Oil as one of their base oils. Plus I didn't want a nail oil with 20 ingredients I couldn't pronounce. I wanted an oil so pure and simple that I could eat it. And I CAN eat it! After 5 days of rubbing my Simply Pure™ Nail and Cuticle Oil into my nails and cuticles several times a day, I could feel that my nails were stronger and more flexible. After 120 days, my nails were longer than they had ever been in my life! And I was still doing everything that I usually did with a hectic household of four children—washing and drying laundry, hauling Costco groceries into the minivan and then into the kitchen, cooking, doing dishes, etc. As an added benefit I noticed smoother, younger looking skin, hydrated cuticles that no longer cracked, and my hangnails disappeared! How Does Simply Pure™ Work? Just how did I go from brittle, breaking nails to stronger more flexible nails in just 5 days? I'm spilling the secret! Because dry nails crack and hydrated nails bend. Pure™ is truly a nail oil rather than just being a cuticle oil. Nail Oil is the glue that holds about 50 layers of your keratin nail fibers together. Your body produces oil naturally (sebum), but not enough to keep up with our constant hand washing. Sure, you can use any oil to soften your cuticles—but for a nail oil to be effective, it must contain Jojoba Wax Ester. And the oil blend must contain it as the first ingredient to truly be a nail oil. Jojoba wax ester is the smallest oil molecule that can actually penetrate your nail plate and work it's way in between the keratin fibers. The reason? Because molecularly, jojoba looks almost identical to sebum. Oil hydrates your nails. All of the other oil molecules are too big to penetrate your nail plate. If nail oil doesn't have jojoba wax ester—you're wasting your money. Disclaimer: Absolutely none of these pictures have been Photoshopped. The photos are exactly how they came from my camera. The only thing I did was crop them and add the "before and after" text. Before: This is about as long as I could get my nails to grow without them breaking. After: My nails were longer than they had ever been in my life! All 10 nails were this length! My daughter kept telling me, "Mom, this is nuts! It's time to cut your nails!" Before: At 43, my skin was really starting to look my age! After: Since I was massaging the oil into my hands as well, my skin became softer and the wrinkles decreased. Before: My cuticles were dry and splitting. The skin along the sidewalls of my nails was always dry and hard. This would result in many painful hangnails. After: My cuticles and the skin around my nails stay soft and the hangnails have disappeared. Many of the wrinkles have disappeared as well! How cool is that? Simply Pure's™ 100% natural formula leaves nails hydrated and cuticles soft and healthy. 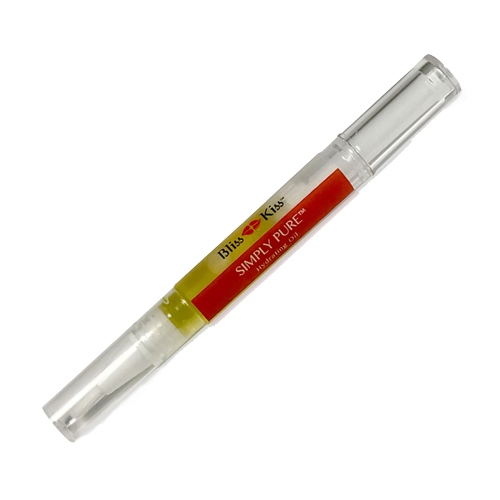 Simply Pure's™ nail and cuticle oil pen no-spill applicator makes this intensive, deep-conditioning treatment easy-to-apply and easy-to-carry. Take it anywhere for soothing relief from dry and cracked cuticles. Simply Pure™ is great for toenails, too! Easy-to-use! Simply remove the cap, twist the top until tip is saturated with oil. I love being able to hydrate my cuticles in the car while stopped at a long traffic signal. I can't do that with a bottle of oil with a polish brush. To maintain freshness, I only make small batches of each oil. You will never receive products that have been sitting in storage for several months or even years. When I was just starting my business, I gave away my recipe. Why? Because I had nothing to hide and I wanted to build trust with you. I also didn't feel that my oil was drastically different than other nail oils on the market. I didn't believe in myself. And I was completely wrong! My customer's before and after photos showed miraculous healing when they took the 3-Day Hydration Challenge. Their cuticle lines were plump and hydrated. Their nails looked glossy and healthy. The hangnails were disappearing. The feedback stories and testimonials convinced me Pure™ was extremely different than everything on the market! My customers had tried several famous name products that I couldn't try (almond oil). They repeatedly told me that those products had never worked as well as Pure™ did in less than 24 hours! The stories made me cry. I was touched to my core. I started to believe in myself and my product. Even customers who made their own oil—and later purchased—consistently told me Pure™ was different and better than theirs! And they were using my recipe! Only two molecules are small enough to move through the 100 layers of keratin that make up your nails—water and sebum (our body oil). My research has shown that jojoba is almost identical in molecular structure to sebum. I knew without a doubt that the difference was the jojoba oil. Pure™ has the highest concentration of jojoba oil on the market. Other companies use jojoba as their 3rd or 4th ingredient, if they use it at all! Why? Because jojoba costs 3 to 6 times more than other oils. It's expensive! Other companies fill their oil with cheaper oils to increase their profit margin. Pure Nail Oil™ is unique—because it actually works. Pure's™ essential oil fragrance blends are husband and daughter approved. My daughter has an extremely heightened sense of smell so if she doesn't approve a fragrance blend, I won't sell it. And my husband? Well—he's a guy. And he can be picky about which perfumes he likes. Pure's™ fragrances just have to smell good to him and he LOVES the Crisp™ fragrance! You'll want to have a pen in your purse, on your nightstand, in your office desk drawer, and in your car, so I've made the 4 pack of hydrating nail pens a better investment. You'll be saving over $4.00 off the individual price. With your fingers, rub the oil into your nails and fingers up to the knuckle closest to your nail. Spend a little time rubbing the matrix (right behind the cuticle) This increases the blood flow to where your nail is formed so they will be stronger and healthier. Follow the application directions above. When you're finished, your nails will feel a little oily. Periodically through the next hour or two, rub the oil into your nails. Each time you do this the nails will feel less oily. When you feel the oil has been absorbed, reapply. Repeat step 4 for the first three days. When you get to the point that it takes your nails 4 hours or more to absorb the oil, you can move to the basic daily application. Again I have to thank you. You and your amazing oil have changed my entire world, as crazy as that sounds. You've seen the results, and now? I'm no longer ashamed of my hands, my cuticles look better than ever, my nails are stronger and growing like crazy (having to file them back was pretty cool...normally my ring finger would catch up and surpass the rest, but they're now all growing normally), and I actually enjoy going naked every once in a while to keep my nails and cuticles up to par. My hands, although they have a ways to go, are looking so much younger that my husband and family have commented that my hands no longer look old and wrinkly! Some of that is the whipped butter, I'm sure, but we all know from that first knuckle up, Pure™ is responsible. And my favorite thing? No more filters, harsh lighting, or tucking my fingers back for photos! All I have to do is take the pics, crop and watermark them and I'm done! None of this would be possible without Pure™. It's honestly just that simple." To see before and after photos from other bloggers, visit my Pinterest Board.